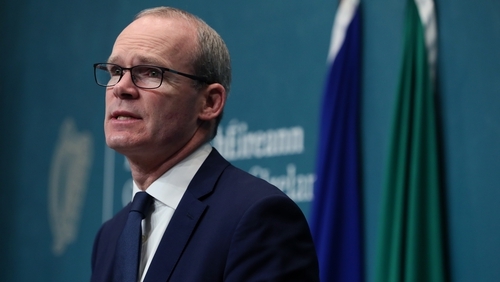 Tánaiste Simon Coveney says there is a lot of concern among EU states over the prospect of a long extension of the Article 50 process, to give the UK more time. Speaking after a special Article 50 formation meeting of EU foreign ministers - without a UK representative - he said any decision to grant extra time to the UK would have to be based on what he called a "persuasive" explanation and plan for how to use that time to conclude the Brexit process. The Tánaiste said the "disruptive effect of the Brexit process continuing for another nine months or whatever period of time is something that people will need a lot of convincing about". Mr Coveney said the EU faces its own election cycle, the formation of a new Commission and is "dealing with a lot of other things at the moment", and does not want the Brexit process impinging on them. He also said it is clear there is no appetite for making any changes whatsoever to the Withdrawal Agreement. But he said Michel Barnier has constantly said there is lots of scope to change the political declaration on the future relationship between the EU and the UK. But the main thrust of his remarks was that the EU does not want to grant extra time to the British only to see a continuation of the same political impasse that has been there for the past four months. "The EU does not want to grant extension to the UK that brings us back to the same point we are at today in three, six or nine months time, having wasted a lot more time. That message is very clear today and it’s up to the UK to respond to that", he said. Any plan would have to show how a majority can be found in Westminster to vote in favour of the Withdrawal Agreement. Mr Coveney said that it was important that the UK understands that while there is an "openness" among EU leaders to granting an extension, it should not be taken for granted. He said the UK’s de facto deputy prime minister, David Liddington, will have a clear understanding of what is required, following meetings with several EU ministers and Michel Barnier today. In a reminder to the UK political and media system that Westminster is only one part of the Brexit process, Mr Coveney said that often in the UK the focus on Brexit revolves around trying to find agreement in the British parliament - there are many other countries affected by Brexit and the disruptive effect of another nine months of this for the EU as a whole is something people are worried about. "There is a willingness to agree an extension but EU leaders will demand a credible plan of action to get us over the blockage in Westminster, and I don’t think that is unreasonable," he said. He added "It would be very foolish to assume this is some kind of political game, and an extension will be easily granted: EU leaders will be demanding in wanting to know how time will be used to implement a new plan of action that can help a British parliament to get beyond the impasse that is preventing an agreement." Although an extension to the Article 50 timescale requires unanimity from the 27 heads of government, Mr Coveney said he believed there would be a "collective approach" to the decision: "I don’t think you will see any countries getting isolated from the pack", he said.